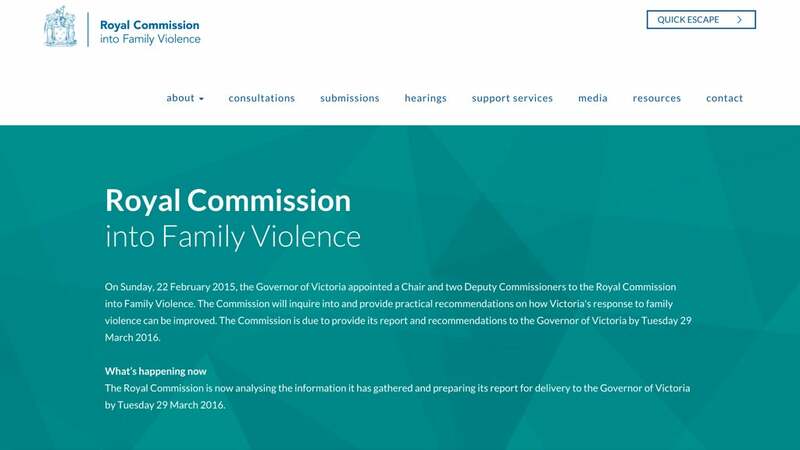 In February 2015, the Royal Commission into Family Violence was set up by the Victorian Government to investigate the causes of family violence and to make recommendations to help foster a violence-free community. The Commission approached Luminary to develop a website that would provide access to information about family violence, allow users to make a submission to the Commission, deliver live streaming of the hearings, and ultimately enable people to download the Commission's report. Due to the nature of the Royal Commission, the site needed to be developed quickly. The challenge was to develop it in such a way that could scale to meet the future needs of the Commission as its role evolved. The site also needed to be able to provide information to people affected by family violence in a way that would ensure their privacy and safety when accessing it. The solution included a content managed responsive website that featured live streaming of the hearings and a 'quick escape' button that would immediately shut down the site to protect people's privacy. Luminary utilised a range of cloud servers that would scale based upon demand. The Royal Commission’s aim was to provide as many people as possible with access to the hearings. The solution that Luminary developed provided live streaming of the daily hearings to people all around the world, with 100% uptime. The site was fully responsive, so users could watch the hearings on desktop, tablet or mobile. In the two weeks following its tabling in Parliament, the Commission's report was downloaded thousands of times, with an enormous amount of data served in a short space of time. The report is expected to be pivotal in providing a blueprint to overhaul the family violence system in Victoria and beyond.